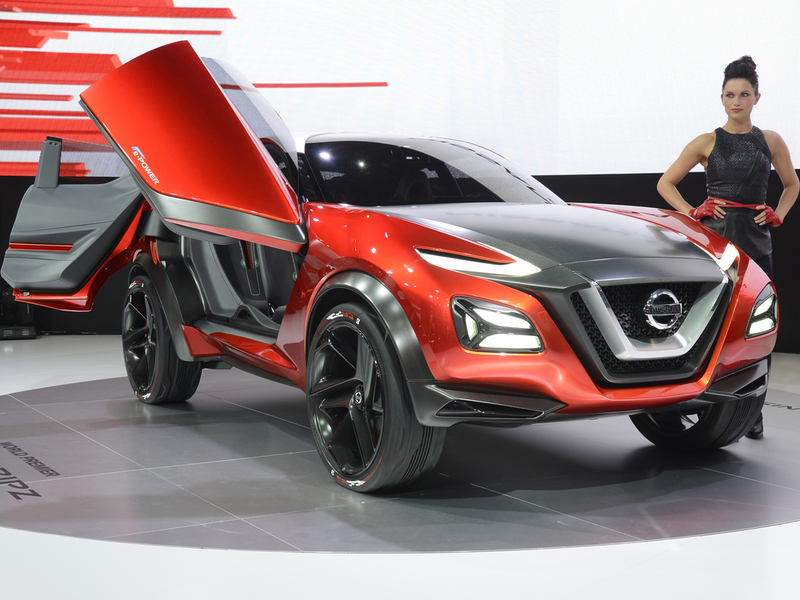 Nissan has pulled the covers off its new concept car - the Gripz. 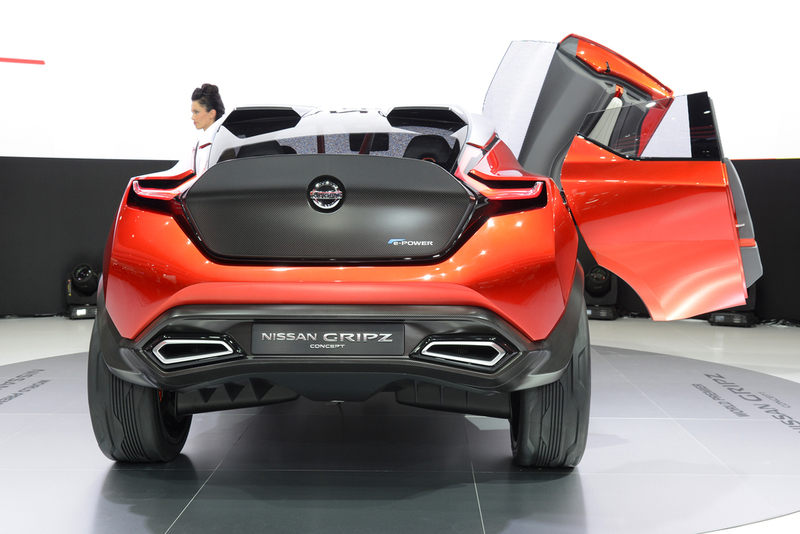 Pointing to a 'new future' for the marque, the Gripz 'blends the ability and practicality of a compact crossover with the excitement and performance of a sports car' says Nissan. 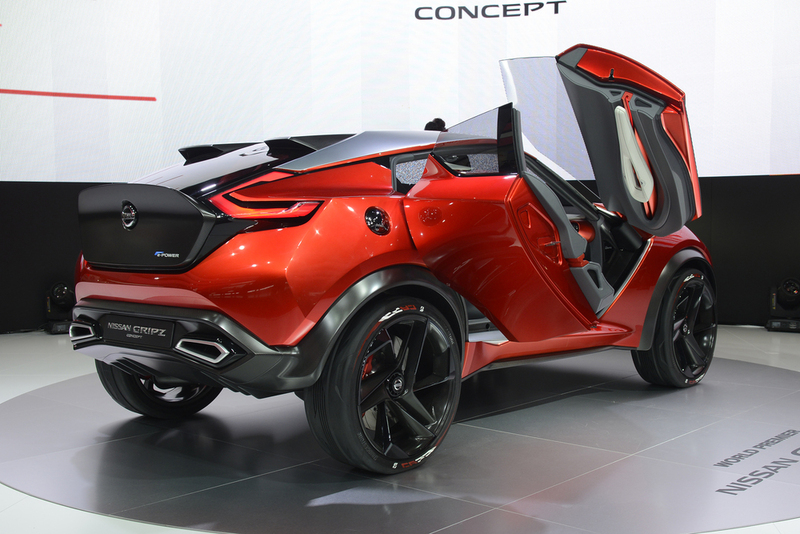 With a radical design and advanced powertrain - the concept is a glimpse of how a future compact crossover might look. The Gripz has the silhouette of a sports car with a raised ride height, equipped to 'conquer more challenging driving conditions'. The result pays homage to one of Nissan's first 'crossovers' - the Safari Rally-winning Nissan 240Z. In the 1970s these sports cars were re-engineered to cope with the demanding desert conditions and featured a raised ride height, toughened suspension and sported a matt-black finish for the bonnet and boot set against a deep red-orange body colour. Powering the new Gripz is a hybrid system 'Pure Drive e-Power' - an efficient petrol engine is used to power the electric motor found in the Nissan LEAF. This configuration delivers 'smooth, swift and linear' acceleration in near-silence, with 'supreme' efficiency according to Nissan. The concept incorporates four key design elements first seen in Europe on the Nissan Sway, seen at the 2015 Geneva Motor Show. As with the Sway, the Gripz features a V-motion grille, boomerang lamps front and rear, a floating roof and a kicked-up C pillar. However, while the Sway hinted at a possible direction for a compact hatchback, the Gripz is quite the different proposition. Taking the 'high-tech simplicity' - two apparent contradictions - of a racing bicycle as inspiration, the concept features a carbon frame over which body panels are placed, like armoured cladding. Exposed carbon elements are visible through the design, accentuating features such as the boomerang-shape given to the leading edge of the front door structure. With dihedral front doors that swing out and up when opened, and a pair of rear-hinged half-doors behind, there is no B-pillar allowing easy access to the 2+2 interior. Embedded in the lamps are forward-facing cameras that record every journey, using a live feed, the images can be beamed around the world, allowing for friends to follow the car's progress on their computer, tablet or smart phone in real time. Boomerang-shaped running lights sit above the lamps, on top of the front wings and denote the line between the matt-black bonnet and the red-orange main body colour. More matt-black can be found on the extended wheel arches, the 'pinched' and indented triangular sill - raised to increase ground clearance - and the A-pillar leading to the floating roof - which features a central glazed panel with bullet grey-coloured composite panels on either side over the seating areas. At the rear, a matt-black Kamm tail gives the concept a 'codatronca' effect while beneath the tailgate sits a pair of chromed trapezoidal exhaust pipes. The three-spoke 22-inch wheels are also inspired by racing bicycles - lightweight yet strong wearing comparatively thin high-pressure tyres, especially constructed for the concept by Bridgestone. Red and white graphics found on the sidewalls are replicated on the car's steering wheel. The interior includes a mix of matt-grey and the deep red-orange colours and underlines the car's 'Tour de France' inspiration with exposed tubes, moulded bucket seats and layered features echoing the cladding effect found on the exterior. The seats and centre console are directly inspired by bicycles, as are the door pulls that are shaped like saddles from a racing bike. The three-spoke steering wheel, meanwhile, replicates the car's road wheels. A 'Gliding Wing'instrument panel is 'elegantly thin' in design and combines 'strength with simplicity', says Nissan.